During the summer my kids usually eat about a million times a day…so I usually like to make something that I can make ALOT of and is easy to warm up. Its an easy meal for them to eat and its filling. So, whenever crawfish tails are on sale at my local market ….I would grab like 6 packs because I use them so much in my pasta dishes. This brand is usually around $8.00 to $10.00 at some grocery store but this week they are only $7.99 a pack…so I grabbed 10 packs..hopefully they will last me until the next sale. This crawfish roban pasta dish is my GO TO ….I can whip this up early in the morning….I usually make it all in 1 pan…I would cook the pasta…drain out the water…leaving about 1 cup in the pan with the pasta…then just dump all the other ingredients right into the same pan and just cook for another 10 minutes. 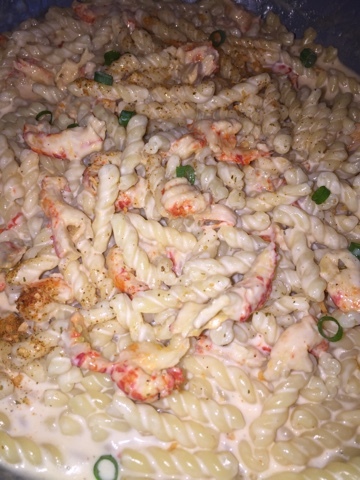 ***If you don’t have Seafood Pasta Seasoning..you can use any Cajun or Creole seasonings. You can order them from AMAZON..just click on my link or the picture..and it should take you straight to the link. In a large nonstick pot….pour the pasta back into the pot next pour the jar of alfredo sauce and 2 cup half n half. Pour the pasta water into the empty jar of alfredo sauce and shake it really well…this is to get all the sauce that is stuck inside the jar out…then pour that into the pot. Next, mix in the seafood seasoning (if you don’t have seafood seasoning you can use any creole or cajun seasoning), garlic powder, and black pepper. 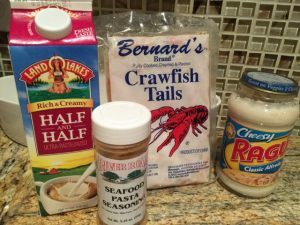 Cook on medium low until everything is incorporated then pour in the whole crawfish tail bag…all the JUICE and everything….cook for another 5 minutes…then pour in the parmesan cheese and SERVE. SIDE NOTE: If you have any SHRIMP and CRAB BOIL liquid…when you are cooking up your pasta..add 1 capful to the water. IT MAKES a HUGE DIFFERENCES! !